Posted on May 31, 2017 . by Patrick Johnstone. 1 Comment. Just for a change of pace, we had a relatively short meeting with a very long agenda. This happens when we have a smooth Public Hearing, no Public Delegations, and a fair amount of the Agenda being passed on Consent. We had an open Workshop during the day, and I recently received an Ask Pat on one of the topics, so more talk on that then. The other topic is Integrated Stormwater Management Plan, which I could go on for hours about (as it somewhat intersects with my professional life) so I’ll save you the boredom and ask you to watch the video if you care! This project will bring 78 units of (relatively) affordable family-friendly family homes to a large site in Queensborough that has been pre-loaded for a number of years, and will dedicate the waterfront portion of the adjacent properties to the City to continue our Queensborough waterfront trail. The unit mix (18 duplexes, 14 fee-simple row homes, 10 small single family detached homes, and 36 strata townhouses) provides a lot of housing variety, and the development is relatively dense for what is all ground-oriented housing. The development is within 5 minutes of schools, parks, and the commercial strip on Ewen Avenue. We received a couple of delegations speaking in favour of the development (one was the architect, so no surprises there) and one in opposition. The opposing delegate was chagrinned by the loss of farmland in Queensborough, although this site has not been a farm for a very long time. Council gave this OCP amendment Third Reading and Adoption. It is now the Law of the Land. Council Approved this Zoning amendment, which essentially means we approved the development. The Intelligent City initiative is rolling along, with several different parts of the overall plan being overseen by different City staff groups working with community members. The Innovation group are working on the development of an Innovation Hub in New West, and are working to bring some innovative use of technology to our Master Transportation Plan goals. They have also been instrumental in the development of our Open Data Portal, which is now award winning. The Knowledge Workforce group are working with local and regional education leaders to develop programs like last year’s successful Hackathon. There is a tonne more going on with this initiative, with more updates to come! There are some staffing changes at the City, and the role of City Clark is one that needs to be approved by Council, because they have a regulatory role under the Community Charter and delegated authorities under our Bylaw. We did so for the new Acting Clerk. Our FOI requests are generally down (22% over the last three years), partly because of our becoming a more open organization (see award-winning Open Data portal, above). This is a good thing, as I think it demonstrates increasing trust in how the government operates. It is also good because FOIs take a lot of resources to manage, both to assure the data provided is complete, and also to assure that privacy issues are adequately addressed before data is released. Our response rate to FOI requests is also improved, which again saves us time and money. Because we are in the Heritage Control Period for Queens Park, a Heritage Alteration Permit is required prior to the issuance of a Building Permit for this house. The process this house went through is actually more rigourous than the one proposed for the Heritage Conservation Area Bylaw, but met almost all of the guidelines proposed for that process. The Technical Review Panel and Community Heritage Commission approved the design, and Council supported the HAP. The use of commercial spaces in the City for worship is closely regulated, for several good urban planning and business development reasons. As a general rule, the City discourages the use of commercial space for religious assembly. In this case, and organization is requesting temporary use for a small congregation as they are actively seeking a permanent location, and the proposed temporary use supports other uses of the site. Council granted this temporary use. As mentioned last meeting, the conversion of the existing gas station uptown to a 7-Eleven location necessitates a variance of the sign bylaw, as their standard signage (which is actually smaller than what is currently there) does not fit the strict language of the Bylaw. Apparently, our notice of the opportunity to be Heard issued last week also required a bit of a language change to better reflect the variance. If you have a strong feeling about this signage, lease let us know by June 26th, when the Opportunity to be Heard will be held as part of regular Council. Every year, we get a report of the extensive testing of our potable water supply. Short version: the 744 samples taken in 2016 were clean and safe to drink. Bottoms up. The City has about $136Million in various investments, and we have made about $1.0 Million in interest in those investments so far this year, tracking to a budgeted $2.6Million for the entire year. Continuing on the theme of Open Government, here are all of the contracts larger than $100,000 that the City signed in the first third of 2017, and all of the Sole Source Awards larger than $50,000. If you bid and didn’t win, here is why. Surf Net becomes the sixth vendor hoping to sell internet service though our BridgeNet dark fibre utility. How fast is *your* internet service? Check out the Fitness Day (June 3) offerings at the Centennial Community Centre, Canada Games Pool, Queensborough Community Centre, and Century House. I’ll be in Ottawa attending FCM, so please feel free to exercise on my behalf! This four-story apartment building in Port Royal will require a variance to allow mezzanines and roof-top decks (which means it will be 12 feet taller than the zoning allows). There will be an Opportunity to be Heard on this variance on June 26th at Regular Council. C’mon out and tell us what you think. We are moving along with the process of developing a small affordable housing development in City-owned land in Queensborough. With this first and second reading, the OCP amendment and zoning will go to Public Hearing on June 26. C’mon out and let us know what you think. Not burying the lede here, but this large development that will re-make the shape of our waterfront for a generation does not require a formal Public Hearing, as the Development Permit and Zoning are already completed. However, the shape of the buildings has changed, and it does require several variances: for height, building footprint, and parking layout. There will be an Opportunity to be Heard on June 26th. This is your chance to come out and tell us what you think about this development. Cars going 30km/h are significantly safer in our residential nieghbourhoods (and everywhere) than cars going 50km/h. Unfortunately, the Ministry of Transportation makes it difficult for local governments to regulate safe speeds in our communities, because they think 50 is nifty. In character with our Master Transportation Plan, the City is working towards bringing 30km’h in the most appropriate places where it will have the largest safety benefits. We will be phasing in 30km/h along greenways where we are encouraging cyclists an pedestrians, and in the areas of the City where the Street and Traffic Bylaw makes it illegal to ride on the sidewalk (primarily Uptown, Downtown, and Sapperton business districts). It is a start, and perhaps with a potential change in Government in Victoria, we will have more support to make it easier (and more cost effective) to make our nieghbourhoods safer for pedestrians. The good news is that this may be the impetus we need to update our live and recorded video streaming service. The SilverLight®-dependant and slightly clunky interface we currently have is not exactly state-of-the-art, and I am hoping we can have a product that not only streams on more devices and through more browser types, but has search functions and links portions of the evening’s Council to agenda items so people can zoom to the part of the meeting that they care about. Hopefully good things to come by the end of the summer (and we can release Wes of his http://newwe.st/open-council/ responsibilities). The City collaborated with graduate students at UBC’s Sustainable Community and Regional Planning (SCARP) program to develop this comprehensive strategy. They presented to us some great demographic research, and provided a great set of guidelines and strategies to help us adapt to the upcoming demographic certainty of an aging (and healthy-into-older-age) community. These strategies will help us develop the services needed to for seniors to stay engaged in their community, assure our built environment makes it easier for seniors to live in an navigate through our community, and to partner with service agencies and senior governments to provide the necessities of life like appropriate housing, access to healthcare, and peer support. I’m really proud of the work our Staff did here with SCARP. I’m happy we found a way to accommodate this use, but I am afraid we are still holding onto some of the moral panic issues that led to strict restrictions of arcades on the 90s. I don’t understand why we think people can responsibly drink a beer, we think people can responsibly play Pac Man, but if we let people do both at the same time, trouble is inevitable. However, this Temporary use Permit may help us address some of the potential conflict issues while we try this on for size. There will be an Opportunity to be Heard on this temporary use, please come out June 26th and let us know what you think. These three Bylaws that support the development of a 6-story residential development and protection and restoration of a heritage home in the Brow of the Hill saw Third Reading on January 30th, and are now adopted by Council. Please adjust your behavior accordingly. These Bylaws that support the subdivision of a property to facilitate the protection and restoration of a heritage home and building of a second house in the West End saw Third Reading on February 29, 2016 (!) and is finally ready for adoption. It is now the Law of the Land. This Zoning Amendment to change an archaic commercial zones property to residential to facilitate the building of a single family home in Queensborough was given third reading on April 24, 2017, and is now law. The zoning changes to support the small affordable housing project in Queensborough was given two readings. The Public Hearing on June 26th will be your chance to come on out and tell is what you think. 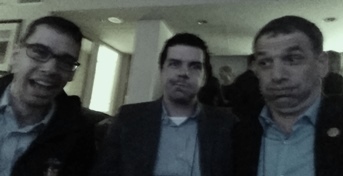 And except for singing Happy Birthday for the seconds time in as many months at Council, we were done for the day. Posted on May 19, 2017 . by Patrick Johnstone. 1 Comment. This election has, once again, perpetuated a Two Solitudes impression about British Columbia. 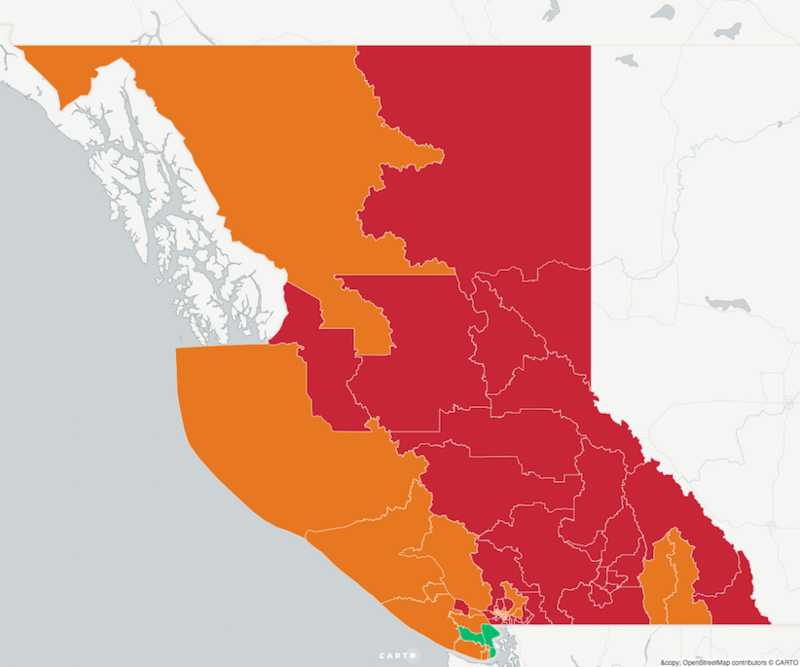 Ridings that touch salt water almost all went NDP, those without tidewater almost all went Liberal (and those who can see the Saanich Peninsula went Green, but let’s put that aside for a bit). As a person whose job it is to make a city in the Lower Mainland work better, I was pretty clear in my biases, so feel no need to extend my earlier gripe about Sam Sullivan into a wider one about how the BC Liberals seemed to not just ignore the Lower Mainland, but treat it with a bit of distain. Sometimes it seemed like policy decisions were made to specifically piss off the Urban Elites of Greater Vancouver. At the same time, John Horgan was criticized for not spending enough of the campaign North of 50, or reaching out to the recourse communities of the interior that used to be the NDP bread and butter. Regardless of causes or coincidence, the idea of battling regions in a province as economically and physically tied together as BC does nothing to help advance anyone’s interests. Much of the economy of the Lower Mainland is tied to resource extraction, agriculture, and energy drawn from the interior, and almost every service the interior receives from government (health care, schools, roads, etc.) is heavily subsidized by the taxes of residents and businesses of the Lower Mainland. However, neither of those should be political fodder: the province is a confederation of interests that should work together to raise the quality of all of our lives. So when a premier suggests that people in Prince George shouldn’t pay through their taxes for the Port Mann Bridge, it is an intentional attempt to drive a wedge between the regions. When Vancouver mentions that more people work in high tech industries in the Lower Mainland than all resource extraction in the interior, it similarly creates a category of “them” that leads inevitably to “othering” their problems. And don’t get me started on the whole topic of The Gateway. This regional divide needs to be addressed as a potential to grow the province and get it working better, instead of a convenient political wedge to divide the province. People in Vancouver have to realize that gas and ore and timber and fruit from the interior are important to the provincial economy, and that people in the interior lack many of the services we take for granted – high-speed internet, reasonable access to healthcare, public transit. People in the interior need to understand that the lower mainland is the real economic driver of the province, and that making that economic machine work better through transportation investment or affordable housing actually helps pay for the services they do have access to. I suggest we need someone from the provincial government to talk about the stresses that are specific to regions, and to work with the other ministries to help bring regional voices to the table and make the confederation work better. They could work with the local government organizations (LMLGA, SILGA, NCLGA, etc.) to bring their concerns to Government, and with the UBCM to balance needs. The name I’ve given it might be too Utopian for 21st century post-growth politics, but a person needs to do this job. Posted on May 17, 2017 . by Patrick Johnstone. 1 Comment. At New Westminster City Council, we have Open Delegations, meaning anyone can come to a Council Meeting and have 5 minutes to delegate on any topic. There are not many cities where delegations are so open (most require you to address a topic on the day, register ahead of time, limit numbers, etc., if they have delegations at all). This week’s meeting was one of those ones where people showed up in force, arguing both sides of an upcoming issue, which kept us going until after 11:00. More on that later. There is a coordinated regional count of homeless persons every few years, run mostly by volunteers as it is a fairly large effort. The numbers in 2017 are not good, which is probably not a surprise to most who pay attention to these things. You can read the preliminary report here. Regionally, the numbers of homeless have risen since 2014, after being mostly stable for almost a decade. We can point at the general housing afforability crisis, increases in renovictions, and reduced provincial supports for marginally housed or people impacted by addictions, those living on social assistance or with disabilities. There are a lot of trends to parse out here (i.e. increases over the last 3 years are markedly higher in the suburbs – Delta, Langley, Richmond, Ridge Meadows and the TriCities), and I will probably write a longer blog post on this topic. Council moved to refer this report to staff in order to develop resolutions to take to the UBCM to address this issue. A gentleman named Daryl Mutz passed away in January, and left part of his estate to a variety of causes that were important to him, mostly protection of animals and children. Included in his bequest was $275,000 for New Westminster Animal Services to improve the quality of life of animals being cared for at our shelter. The City will be working on an appropriate way to mark this significant contribution, likely as part of the new Animal Shelter that will be built in Queensborough. As part of ongoing reviews, we occasionally adjust fees for some of our facilities, which require a Bylaw to change. Some of the dace spaces in the Anvil Centre were determined to be underutilized, and a price comparison to other similar spaces around the region found that an adjustment to the cost may be in order. Council voted to support this Bylaw change. This topic did bring many people out to delegate, both in favour and opposed. I don’t want to go too deeply in to the debate here, because this will be going to Public Hearing next month (a special Council Meeting scheduled for June 13), and I don’t want to pre-judge those discussions. Council moved to give the proposed Bylaw first and second readings, and the schedule a Public Hearing for June 13. As per regulation, once the Public Hearing is scheduled, we cannot receive any more public delegations on the topic until the evening of the Public Hearing. However, I hope residents will go to the City’s website here and inform themselves about what the HCA is and isn’t, and chat with your neighbours about the goals and concerns it may raise. Then show up on June 13 to let Council know what you think. This has been the culmination of a couple of years work for our staff, updating our slightly-aged Sign Bylaw. It appears to me to be a reasonable approach, considering some significant changes in sign technology, but also creating stronger guidelines around physical intrusion of portable signs in to pedestrian space and the use of LED lights and other emergent technology. It also sounds a potential death knell to Wacky Waving Inflatable Arm Flailing Tube Man, pictured above. Council moved to give the Bylaws three readings. This Queens Park property owner had various constraints on the development of their property, and is doing this work at the time that the Design Guidelines for the Queens Park Neighbourhood are in a kind of flux with the Heritage Conservation Area Bylaw in development. Staff worked with the proponent to find compromises that would allow them to build within the guidelines and protect mature trees on the lot, but this required relatively minor variances. These variances will go to an Opportunity to be Heard at the end of May. The gas station on Eighth Ave is changing branding of their convenience store, and the preferred signage, though not fitting the letter of our (old) Sigh Bylaw, will nonetheless not be a significant change from the existing signage. However, laws be laws and a variance is required to permit the change. This variance will also go to an Opportunity to be Heard at the end of May. This is a good sign that the Pattullo Bridge project is moving forward. The EA process is fairly prescribed, including timelines. The first public participation part of the EA is during the pre-application phase, where the proposed application is reviewed and stakeholders are able to provide feedback to the EAO about potential gaps or issues with the application materials, and give the proponent and the EAO an opportunity to understand public concerns regarding the environmental impact of the project. There are some tentatively scheduled public meetings at the end of May in New Westminster and Surrey – be sure to check the project website and keep an eye on the local newspaper for updates. In my professional life, I have worked on a half-dozen EAs for major projects, and can attest that active participation by the public is important to the process, but takes some commitment on the part of those willing to take part. There is a lot of information to absorb and understand, and the constraints around what can and cannot be addressed through an EA are not always straight-forward. I encourage people to follow the project website, show up at the meetings, and get informed about this project. Next week is National Public Works Week, and the City’s engineering department will be doing some outreach to the community to help people get informed about what our Public Works staff do in keeping your City functioning, including being at the Bellies game next week. The City, along with many other communities in the Lower Mainland, provide parking benefits to those who display Veteran’s license plates. As this regulatory change requires periodic update, here we are doing that update to keep that benefit going for another few years. This really should be bigger news than it is. The City applied for, and was granted a $5.5 Million grant from the federal government to accelerate our sewer separation program in Sapperton. $5.5 Million is a lot of money for New Westminster, we should be excited. This being an old City, most of our sewer system was installed in the good old days when all sewage went straight to the river, so our storm sewer (rain running off of our roofs and streets) and sanitary sewer (the things you flush) went in the same pipes. As society evolved to building sewage treatment plants, cities started putting storm water and sanitary sewer into different pipes, so the former could go to the river, and the latter could go to the plant. Unfortunately, New West has a long legacy of “combined flow” pipes, and have been slow to separate the flows. These combined flows are expensive, because we pay to have all that storm water treated as sewage, but separating the pipes is also expensive, so the $5.5 Million will not only save us some money in the short term, but will reduce long-term costs and ultimately benefit the environment. The City is going to pilot some flexible licensing in Pier Park this summer in partnership events with the Arts Council to take advantage of some recent changes in provincial liquor laws. The idea here is to try this out in July under relatively controlled conditions as a pilot to see what works and doesn’t and inform future policy for these types of events. Thursday Nights in July should be fun at the Pier Park! Reschedule your vacations, folks, there is no reason to leave New Westminster during the summer! Notwithstanding the gluteus of a certain delegate, Canada is barging ahead with celebrations of the 150th anniversary of Confederation, and that celebration is manifest in various programs. In New West, our Parks and Recreation department is doing a 150 fitness Challenge. Info available at our Recreation facilities (Century House, Moody Park Arena, Queensborough Community Centre, Etc.) where you can get a tracking card to participate in the program and potentially win some great prizes. These residents in the West End wish to enhance their back yard by putting in a pool and hot tub, but this will result in more site coverage than the zoning strictly allows. This requires a variance, which will have an Opportunity to be Heard at the end of May. This Bylaw to institute a Heritage Conservation Area in Queens Park was given two readings. It will go to Public hearing on June 13, please come on out and tell us what you think. This update to our Sign Bylaw, as discussed above, was given two readings. These Bylaws that will need to be updated to support the Queens Park Heritage Conservation Area if it were to be adopted by council, were given three readings, so that they can be adopted in conjunction with the HCA Bylaw if that is the decision of Council after the June 13 Public Hearing. Once again, I encourage you to read, share and enjoy these Bylaws, and come out to the Public Hearing to tell us what you think. This street naming Bylaw was adopted. A street in Queensborough now has a name. Adjust your Googlemaps accordingly. Posted on May 15, 2017 . by Patrick Johnstone. 1 Comment. The recounts and brokering are ongoing, and I’m pretty sure none of the Provincial leaders read this blog, so I’m just going to spitball a few big ideas that make for interesting conversation and would support (in my mind) a strong Green-NDP alliance that could rule for a full term. I’ll put these out in a couple of short posts. Idea 1: Andrew Weaver as Minister of Electoral Reform. If anyone is interested in the stability of a true coalition, it could be forged by giving Weaver an interesting cabinet post. Environment is an obvious choice, but I think he wold quickly run into conflict, and would perhaps prefer to be “holding their feet to the fire” on that file instead of being the one getting burned. I suggest a better place for him would be leading the move to get big money out of politics and reforming the voting system. These are two goals Horgan made clear were also his priorities during the election, making it their point of connection. Placing Weaver in charge of a non-partisan commission to develop and support the promised referendum on a better voting system should shore up support across for the proposal once presented. We really don’t know what that looks like now, but no-one is more motivated to make some form of proportional representation work than the Greens (with all due respect to the alleged SoCred resurgence). 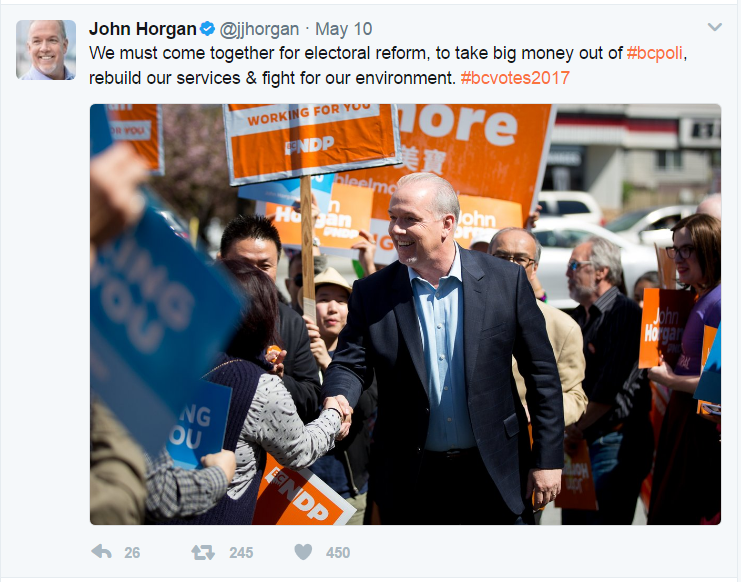 Reforming party fundraising is also something that was at the centre of both Weaver’s and Horgan’s campaigns. Weaver is the one leader who walked the walk on this during the campaign (ending his own Party’s corporate fundraising six months before the writ dropped), and as such may be in the best position to develop new guidelines. It will be interesting to see how donation limits, tax credits, and third-party campaigning will be managed during this conversation, as there are some potentially thorny constitutional issues related to what some would consider a restriction of free speech. Posted on May 10, 2017 . by Patrick Johnstone. 1 Comment. What a crazy Tuesday night. Since I already declared my biases and my opinion that active participation in democracy requires more than voting, it should surprise no-one that I spent a very long Election Day knocking on doors to Get Out the Vote in a potentially close riding. I was then, like many others, up until the wee hours trying to glean every bit of information out of what I was seeing on the TeeVee. It was exasperating, exciting, exhausting. The only thing we know at this point is what we don’t know about how this is all going to play out. But I don’t know a lot, so I may as well write my thoughts. For the NDP, it is hard to not feel like this is a win, if not as big a win as they would have liked. Based on the direction of polls in the last week and the apparent campaign strength of the Liberals, getting close enough to force the Liberals to put their hubris away is a positive result. As critical as some people (including myself) were of parts of the NDP campaign, the benefit of hindsight may suggest they knew exactly where to put their resources, and where the wins had to come. With essentially the same vote as last election, they are within a whiff majority. Because of the wonders of gerrymandering, it was assumed by some that the NDP would need to poll 3-5 points ahead of the Liberals to get a majority of seats, and the strategy of concentrating on “winnable” ridings and holding what they had instead of spreading themselves too thin almost paid off. For the Greens, there is good news, if unrealized hopes. The (potential) hung parliament puts them in a position of delicate power, and only time will tell if Weaver is nuanced enough to wield it effectively. However, if their goal was 4 seats and Official Party Status, they have fallen short, and may again struggle to put together the resources they need between elections to be as strong a voice as the electorate is suggesting they want. There was some excellent campaign work by some local teams (including here in New West), and that will probably pay long-term benefits electorally, but they still have much work to do before they are ready to run a true province-wide campaign and escape the stigma of being thought of as potential spoilers for other “more likely to win” parties. As always, their best bet is still supporting the introduction of some form of proportional representation, only now, they have a clear pathway to get that done. Christy Clark put on a brave face in her “victory” speech, but she was a loser here. Going in, she had every reason to believe this would be a great election. The “Economy” (within the narrow confines of how she defines it) is going great, they had by far the most campaign money available to them, and an almost unlimited amount of pre-election taxpayer dollars to get their message out. They had the endorsement of all major media outlets, the polls were going their way… it was their campaign to lose. Regardless of who holds the balance of power after the recounts and brokering are done, the Premier has lost a lot of her inner circle. Suzanne Anton, Amrik Virk, Peter Fassbender, Naomi Yamamoto. The Holy Trinity of DeJong, Polak and Coleman will hold up her right flank, and it seems Wilkinson is a natural to replace Fassbender as the Minister of Taking Out the Garbage, but there is no doubt her inner circle is damaged. The best she can hope for right now is that final counts flip her a riding or two, and she takes a razor-thin majority into the house. If this happens, we will see a very different Liberal Party, because they will need to be all present for every vote (no sick leave, no vacations, and dear God, no-one die!) and may even, to make passing legislation work, need to work across the aisle and collaborate a bit to avoid chaos. Of course, the same applies if the NDP string together a razor-thin majority or cobble together a coalition. Or we could all be doing this again in September when the current budget runs out. But I’m getting ahead of myself. We really don’t know what the next couple of weeks will bring, but it should be an interesting lesson in civics. Posted on May 3, 2017 . by Patrick Johnstone. 1 Comment. Our Council meeting on May 1st was another long one, as a large number of delegates came to speak to the proposed Heritage Conservation Area for Queens Park. Again, if this proposal moves forward, it will be going to Public Hearing, so do not take Council’s cautious approach to responding to delegates’ direct questions as disinterest, but more an acknowledgement that there is still much discussion to have in the neighbourhood and community before Council makes any decision here. The regular agenda began with a couple of presentations and reports. This announcement is important to New Westminster because it supports the policy goals of our Master Transportation Plan by reducing vehicle reliance in the City, encouraging active transportation choices, and making transportation in our city more affordable for more people. The presentation and report outlined the various ways Car sharing support these goals. Every car-share vehicle correlates with the reduction of 5-11 private vehicles, reducing the need to accommodate cars through parking and road space. For many users, it is more affordable than owning a car, and supports increased use of transit, cycling and walking. I was amazed that there are already more than 500 EVO members in New Westminster, before they even brought any cars here. The QCB has a large yard sale / festival in the summer, which brings in merchants from around the region to activate the boardwalk. The construction ongoing on the waterfront has created a bit of a challenge for them, and there is an underutilized space at the west end of the Quayside. Although the property is owned in partnership with Metro Vancouver, staff have been working with the QCB to provide a one-day license to allow their merchants to park their vehicles there during the boardwalk sale. Liability and licensing issues abound, but it sounds like all three partners are on side here and have worked through most of it. This large family-friendly development in Queensborough will have a variety of housing forms, and result in road and park dedication to the City. Council moved to give the OCP and RZ first and second reading, and send the project to Public Hearing. I’ll hold my comments until then. This is a report for information, you can read it here. Short version: people living in the Metro Vancouver pay more taxes to the Provincial government, in raw numbers and per capita, than the rest of the province. This is especially true of school taxes where the Mil Rate is flat across the province. I am in favour of this motion, and am comfortable moving forward with this naming, but took the time to suggest to my Council colleagues that the Street Naming Policy that underlies this choice needs to be updated. Perhaps this conversation can wait until we hear back from staff on the recommendations of the Truth and Reconciliation Commission (following on our April 10th motion), but as a rule our street names disproportionately acknowledge the European settler experience, and probably fail to recognize the diversity of our history. The city is working with a not-for-profit to develop a small supportive family housing project in Queensborough. This agreement will set out the conditions under which the housing operates, the duties of the operator and rights of the residents (above and beyond those in the Residential Tenancy Act) which make up the “supportive” part of the housing. Council endorsed these principles. Times change, and how we design public buildings change with them. The concession stand in Queens Park needs replacement, as do the attached bathrooms. The new model for these types of facilities on BC (although this has been standard practice in large parts of Europe for a long time) are to make them “gender neutral”, with secure toilet booths open to either gender attached to a common sink/washup/baby changing area. This reduces a variety of barriers, especially with kids and others who need supports to use public facilities, and assures that the rights all persons are protected. This conversation followed more than two hours of public delegations, mostly on the topic of the proposed HCA. It is clear there are a variety of opinions and a lot of deeply felt convictions about this proposal. Unfortunately, there are also a variety of “facts” being provided, which makes the conversation challenging. We have more work to do. This report, however, outlines some of the most important aspects of the HCA proposal, as it details the actual process through which permits and approvals would be managed under the proposed HCA, and also provides a draft of the Design Guidelines that would become mandatory under the HCA if approved. Council was not able to discuss the Design Guidelines in detail, as we had only received them on Monday, and wanted some time to dig through them and have a fuller understanding before we approved them. That discussion will happen in an Open Workshop on May 8th at 4:30 in the afternoon. It will be open to the public as are all Council meetings. For houses built before 1941 (about 500 of the 700 homes in QP), the house would need a Heritage Alteration Permit (“HAP”) prior to demolition, construction on the front of sides of the house (parts visible from the street), or changes in the roofline. Internal renovations require no extra permitting. The proposed changes would be evaluated based on a transparent “checklist” to determine if the changes would significantly alter the heritage of the neighbourhood, and whether alternative approaches to meeting the owner’s zoning entitlement could be found. Staff would review these applications, based on a transparent and clear set of standards, and would deny or approve the permit. If the owner is denied a permit, they would be allowed to appeal to Council, who would make the final decision. All construction on the visible front of the house and replacement buildings would need to meet the Design Guidelines established under the HCA, as approved by staff. For all other houses, an HAP would only be required for new construction or subdivision of the property. Demo permits and renovations would not require an HAP. Staff have tried to develop a fee structure that is fair to all residents of the City, and reduced the cost for renovation vs. demolition, in order to further encourage renovation of heritage homes. The process has also been designed to operate as transparently and quickly as possible, with most permits only taking a couple of weeks to get through the process. The evaluation standards and guidelines have been developed though guidance from the Heritage Commission, Technical Review Panel, and Heritage Working Group, but they will not be involved in the review of individual applications. In the few cases where it will be required, the appeal process will add time – getting on the agenda so Council can have the final say creates scheduling delays – but by delegating authority we simplify the process and make the entire process work faster, more transparently, and at a lower cost to the City and less stress for the homeowner. Again, these proposals are going to be going to a Public Hearing in June. Best if you let Mayor and Council know what you think through e-mail. The building belongs to the province, and the owner is asking us for a demo permit. The building is in terrible condition, and needs to be removed for public safety reasons. It is unfortunate, but the time to save this building was 20 years ago, and it clearly was not a priority. We can move on and start looking at re-purposing this piece of land, which starts with us getting out of the way and giving the province the room they need to remediate the industrial site. As a City we don’t own a lot of land that isn’t already completely programmed, this is an opportunity for us to acquire a valuable piece of land that links lower 12th to the Brow neighbourhood. These Bylaws to support a multi-family development in Queensborough was given two readings. The project will be going to Public Hearing on May 29, 2017. C’mon out and tell us what you think! This Bylaw to name a new street in Queensborough after Mabel Bowell, Queensborough’s first school teacher, was given three readings. These Bylaws to support he building of two stacked townhouses and refurbish and protect a heritage home on Brow of the Hill, as discussed at the Public Hearing on November 28, 2016, were adopted. They are the law of the land. These Bylaws that allow us to collect taxes on behalf of the City’s three BIAs were adopted. Adjust your behaviors accordingly. This Bylaw that sets our property tax rate increase for 2017 at 2.98% was adopted. The bill will soon be in the mail.